These lights feature a brand new dual reflector technology that emits BOTH a spot and driving light beam simultaneously, making them incredibly versatile and effective for multiple applications. A HUGE increase in light! Light output comparable to many higher wattage lights, but with only a 55watt draw! High Impact, Black Resin Composite Body - 55W Halogen Bulb - Polished, Hardened Glass Lens - State of the Art Multi Function Reflector - Reinforced Multi Direction Mounting System, Easy to Install Wiring Harness, Fully Protected Fuse and 25Amp Relay. 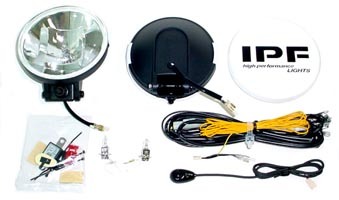 2 Lights with Connectors - Complete Snap Together Wiring Harness & Relay - LED Mouse Style Switch - Light Covers & Detailed Instructions.